Six million years ago, Argentavis Magnificens soared across the Argentinean skies . 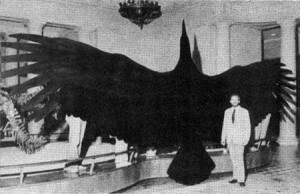 It is the largest flying bird ever discovered and was the size of a small aircraft. Argentavis had a wingspan of approximately 23 feet, a wing area of 75 square feet, and a length of about 12 feet. It weighed 150-170 pounds, which is an average weight for a human. Along with its monstrous size, it had a massive eagle-like beak which allowed it to swallow animals the size of rabbits with ease. This bird was certainly a feared predator. There has been skepticism over the years about whether we can be 100% sure that this bird was actually able to fly. If we look at all of the anatomical evidence, it seems pretty obvious that this creature was able to fly in some sort of way. It had long, strong, and air filled wing bones which are features that are not found in flightless birds. The spacing of attachment points for the creature’s secondary feathers also indicate that the bird was capable of flight. It is extremely difficult for birds with such an enormous size to be able to fly. The main problem that large birds have with flying is the lack of muscle power output in proportion to their weight. As the body size of the bird increases, the weight increases faster than the muscle power output. Therefore, larger birds have proportionately weaker flight muscles in comparison to smaller birds that are able to generate instant lift. Through analysis of the bird’s skeleton, it was determined that the maximum amount of power generated by the Argentavis was about 3.5 times less than the minimum power required to keep sustained flapping flight. How was this creature able to fly? The Argentavis can be best described as a master glider. But, the take-off and landing process was no walk in the park for this giant. There are two ways in which the Argentavis Magnificens would have taken off. One way to take off would have been to gain speed by first running down a slope. This can be an exasperating process because they would need to run down a slope with a 10 degree angle for 30 meters to generate enough lift for flight. If they chose to generate enough speed by falling, they would need to be find a spot high enough to drop about 20 meters in order to level out in still air. Argentavis was basically set up for a crash landing. With a minimum glide speed of 18 m/s, landing must have been an extremely difficult task without gliding into some headwind. However, once in the air, these creatures flew with efficiency and grace by constantly re-shaping their wings during flight. It is believed that they were able to soar for great distances at a very shallow angle of 3 degrees, reaching speeds of up to 150 mph! This incredible and mysterious extinct bird still baffles us today. Very good report of the relevant data to understand the difficulty this big bird had to gain flight! The most telling, to me, was the fact that they would need to drop 20 m before being able to generate a glide. Does this mean that anytime it landed and didn’t have a 60 foot drop that it was stuck walking up the next hill? It’s no wonder this bird didn’t make it to the present.